The S-Series and W-Series feature a tough manifold design with enhanced safety features, available as standard or optional tilt and swivel configurations. Robust positioning handles on each side of the tool ensure safe and easy handling while providing additional maneuverability. An additional top handle mount on the W-Series facilitates safe fastening by keeping operators’ hands clear of pinch points even in hard-to-reach applications. X-Edition tools are constructed of solid steel for maximum durability and minimal deflection. Consisting of only a few, easily accessible moving parts, X-Edition tools allow for quick and easy maintenance, increased uptime and reduced total cost of ownership. 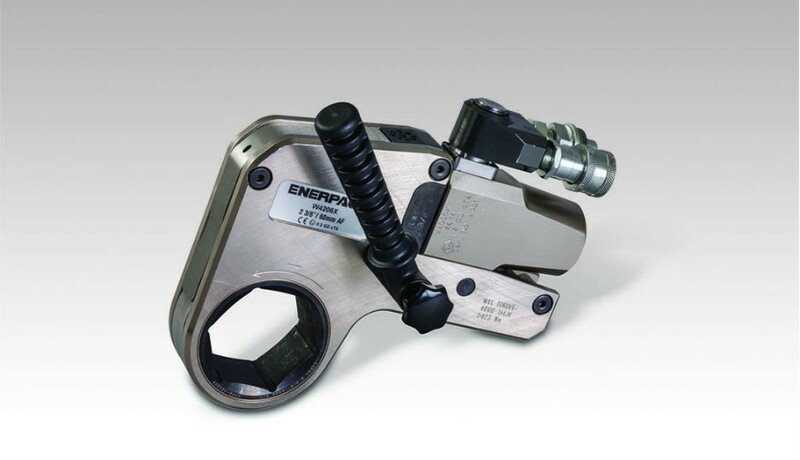 "The X-Edition tools incorporate the performance and simplicity of our standard S&W line, while adding features and benefits that will make a real difference in the field," said Kurt Huber, Global Product Manager – Bolting, Enerpac. "The X-Edition tools provide a unique combination of safety and performance features that are designed to give operators the best hydraulic fastening solution possible in terms of safety and ease of use." All X-Edition tools are performance tested and shipped with a factory calibration certificate and CE-ATEX declaration in every tool box. For enhanced traceability, the model number, CE number and ATEX designation are engraved in the tool bodies. X-Edition tools will be replacing standard S&W Series tools as of April 1, 2015 in Canada and the United States. X-Edition cassettes, drive units and most accessories are compatible with standard tools.